TIJUANA, Mexico (AP) — Migrants camped in Tijuana after traveling in a caravan to reach the U.S were weighing their options Tuesday after a California court blocked President Donald Trump’s asylum ban for illegal border crossers. Many said they have no intention of breaking the law, but were feeling pressure after anti-migrant protests in this Mexican border city and claims by Trump and the Tijuana mayor that the caravan harbors gang members and criminals, something they strongly deny. Keven Paul Mejia, a 27-year-old former security guard from the Honduran capital, Tegucigalpa, said there were some delinquents traveling with the group of several thousand who smoke marijuana and get drunk. But, he said, most are like him, just hoping to land a job in the U.S. “There are more of us who are good, than bad,” Mejia said. Herson Cordonez, a 29-year-old Honduran, said the actions of a few migrants were tainting the image of the 4,000 to 6,000 in the caravan, not all of whom have yet reached Tijuana. “We are not criminals, we are migrant workers,”Cordonez said, adding that he was considering trying to get into Canada if the U.S. doesn’t want him. On Tuesday, Homeland Security Secretary Kirstjen Nielsen visited a San Diego Pacific Coast beach examining up close the newly installed razor wire wrapped around a towering border wall that cuts across the sand. On the Tijuana side, dozens of onlookers gathered with cellphones to take pictures of her arrival through the fence. She said there were as many as 500 criminals and gang member in the groups heading northward, though she refused to answer questions about how they were identified or what crimes they had committed. She added that caravan migrants had assaulted “border police in multiple countries,” even using “incendiary devices,” though she provided no evidence. Nielsen said there were 6,200 migrants already camped in Tijuana and another 3,000 in Mexicali, a few hours’ drive to the east. 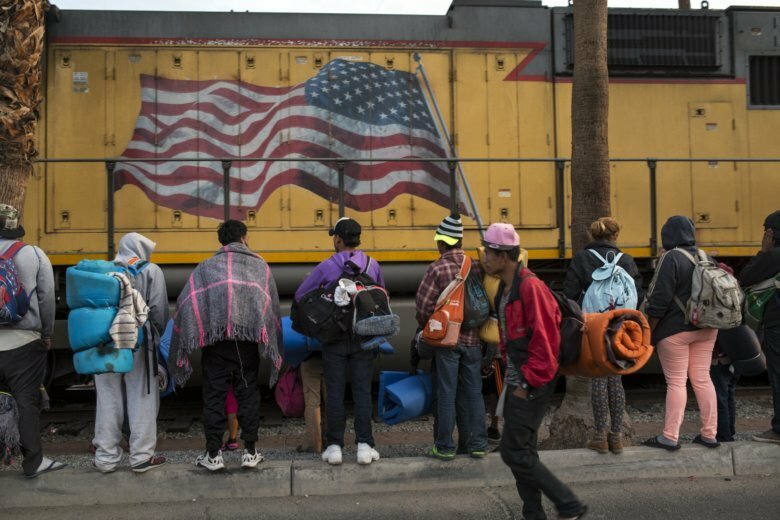 She said most were young single men who have no legitimate claim to U.S. asylum, adding that wanting to get a job in the U.S. or be reunited with family were not reasons to be allowed in. Less than an hour before Nielsen’s arrival a man tried to swim into the U.S. but was quickly detained by border patrol agents. Five agents were on jet skis offshore along with two border patrol boats, while two drones on the Mexican side hovered just above the wall to get a view of the activity. Haitian Chilo Semaco, 36, said Mexico has been “more or less” welcoming to the Haitian immigrants. Since arriving in Tijuana two years ago, Semaco has found work selling aprons to people crossing the border in their cars. “It’s better than being in Haiti,” he said. Some local police and residents have expressed concern that portraying the caravan as criminals has tarred its innocent members and exposed them to reprisals. Some of the largely Honduran migrants were frightened when about 500 people in an affluent district of Tijuana staged angry protests Sunday against the caravan. Dozens of the more radical protesters then marched to an outdoor sports complex near downtown where 2,500 migrants have been staying, sleeping on dirt fields and under bleachers. Walter Matute said he has been deported from the U.S. twice and fears jumping the border would end his ability to get asylum. But he believes others will now take a chance in light of the court ruling blocking Trump’s ban on asylum for illegal border crossers. Sitting on a curb near the sports complex, a Honduran woman affirmed his assessment. The woman, who declined to give her name, said she was getting anxious and was considering crossing illegally to skip the long wait at the Mexican port of entry for asylum seekers. Gastelum, appealing for greater federal help to cope with what he called an “avalanche” of migrants, estimated they would be in Tijuana for at least six months while waiting to file asylum claims. For most people in this city of 1.6 million, the arrival of thousands of Central Americans is not very noticeable. Most of the migrants stay within a three-block radius of the sports complex that faces the towering metal walls topped with barbed wire at the U.S.-Mexico border. But the United States has dramatically increased security at ports of entry in preparation for the caravan, placing cement barriers topped with razor wire that can be quickly moved to block passage if a mass of migrants to try to force their way into the country.